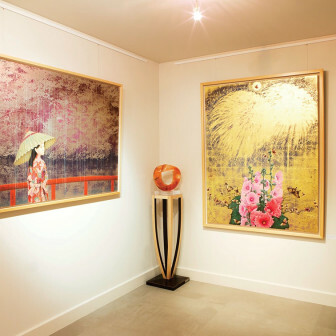 Gallery Elena Shchukina is pleased to present the debut London solo exhibition of Japanese artist Kyosuke Tchinai. Celebrated in Paris for his enigmatic canvases that combine the sensuality of the female form with traditional Japanese motifs, Tchinai creates a mesmerising visual world that hovers between the ethereal, the imaginary and reality. 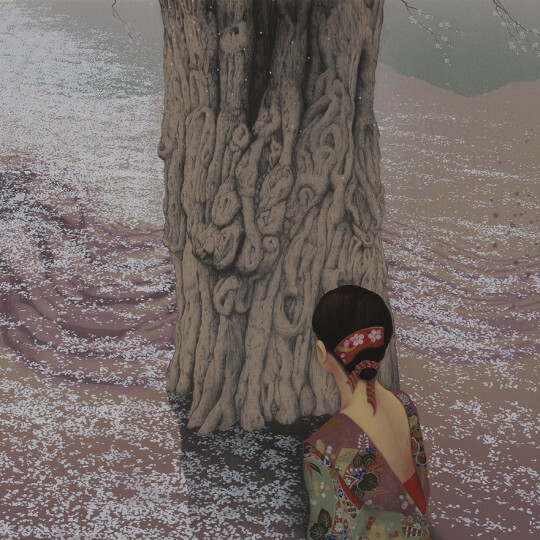 There are dreamyfaced women in kimonos, exotic butterflies and luxuriant flower forms, but so intensely observed and intricately painted that we see every knot in a tree trunk, every stamen in a flower. Tchinai borrows this intense gaze from 16th century Japanese painting of the Momoyama era yet adds a new aesthetic through the surreality of his compositions and techniques. Instead of fine brushwork in precious metals, he sometimes applies whole blocks of gold and platinum leaf or coloured tissue to make a patchwork effect as a backdrop to the imagery. and Music in Tokyo; he received the "Excellence Prize" at the Japanese young artists' exhibition in 1988. 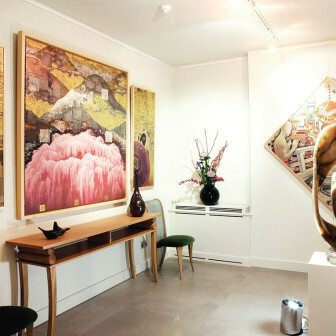 He has exhibited extensively in Japan, including a solo exhibition of his work at the Nakata Museum in 2003 and a retrospective at the Ehime Fine Arts Museum in 2007. 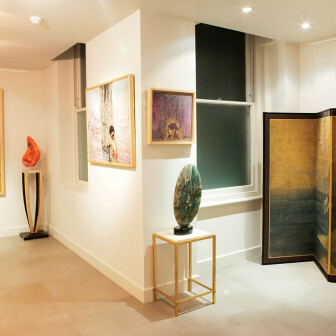 In 2002, Parisian Galerie Taménaga held his first solo exhibition in Europe and has been representing him since.